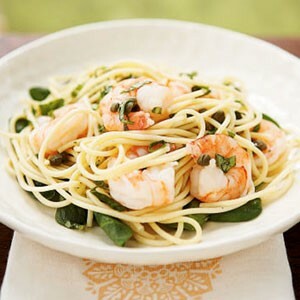 A zesty one-pot shrimp and pasta dish is complete after tossing with capers, basil, olive oil, and lemon juice. Serve with focaccia or crusty baguette. Trim regular green beans if using and in a large saucepan of boiling salted water cook beans until crisp-tender (2 minutes for haricots verts or 3 to 4 minutes for regular green beans) and drain in a colander. In a bowl toss beans with lemon juice, parsley, lemon zest, and pepper and season with salt. The lavender and hibiscus flowers turn this refreshing lemonade a gorgeous hot-pink color. You’ll get the most juice from lemons that are at room temperature. If you can’t find hibiscus flowers, substitute four large strawberries, thinly sliced.